Omani Coffee and a Night in the Nizwa Souq – Oh Man, Oman, Man! Wow! It’s been a long past two days. So much so that I’m going to split them up into two separate blog posts. I’ll open with two photos that I just found now. Having a large family is very normal here. My conversation partner Ibrahim says that most people usually have 7 or 8 children. Yesterday instead of Arabic classes we had classes about Omani culture (of course, still in Arabic). 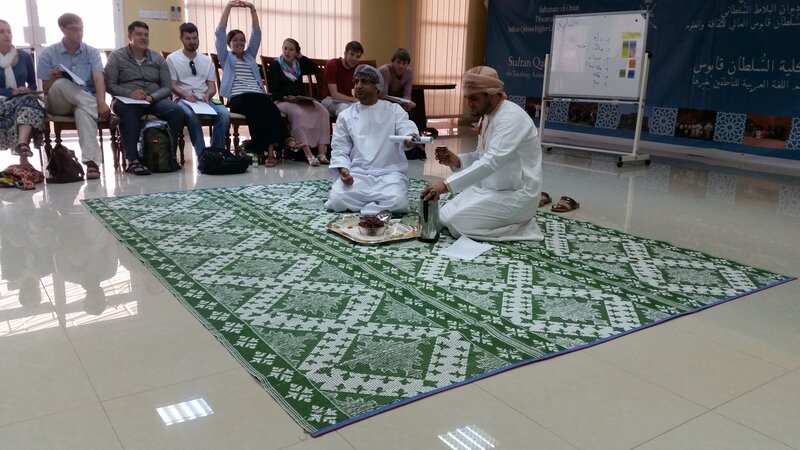 We learned about Omani Coffee and Omani Coffee etiquette. Omani coffee is stronger than the usual American coffee and it is served in much smaller portions. It’s not quite as strong, however, as Turkish coffee, so I actually enjoyed it a lot. I usually hate black coffee, but this was an exception. I volunteered to participate in a demonstration of the correct way to greet someone and sit and drink coffee; of course I sat down the wrong way. In the Gulf and most of the Arab world, it is considered offensive to show the bottoms of your feet to someone because they are dirty, so one must sit on the ground so that his feet our not pointing outward. Obviously, Indian style won’t work, so one must either sit on his knees (which is impossible for me), or he has to sit with his legs crossed in a weird way that you’ll see in one of the pictures. I tried to do the latter but my foot was still facing the wrong way. I didn’t understand what they were saying in Arabic, so Khalil said in English, “This is not an Arab way of sitting”. Anyways, I moved my foot and had no problems. Ustaz Mustafa Abu Saidi demonstrating Omani coffee etiquette. After the demonstration, we all sat outside to have coffee with several Omanis who joined us as well as the rest of the staff from the college. We had a picnic of sorts, with all sorts of fruit and halawiyyat (sweets). My favorite was a type of pasta like thing flavored with saffron that has a flavor that I really can’t describe. I can’t remember what it is called, and I can’t find it online. I also had a piece of some very good mango. Some of the various treats that we had. Dates, Omani desserts, fruits, and Omani bread among other things. Me trying to sit in the “Arab” way with Mustafa; we’re enjoying our coffee. This is the Omani dessert I talked about but am currently unable to find the name. We had a short break in the afternoon. I went to Lulu to pick up some snacks since I had time, and then immediately went to our first extracurricular activity: calligraphy class! Most peoples’ first exposure to Arabic is through the calligraphy, so it’s no surprise that everyone here wants to learn it. We will each have two classes in our time here because our group needs to be split up into two sections of 15 that will have class in alternate weeks. 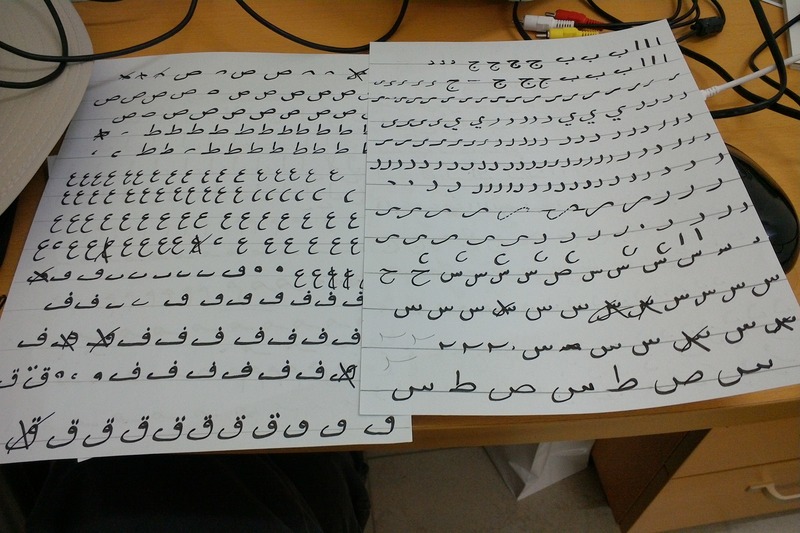 We’re learning the Naskh script, which I’ve actually studied a little bit, but I need much more practice. We spent about two hours going over each letter in detail, and it was a ton of fun. After that, a group of us went to the Nizwa Souq (market) to scope it out, but there wasn’t much open at night. I looked at a lot of stores and tried on some Omani Kummas, but I didn’t buy anything. I tried Zanzibari Karak tea in a restaurant as well. It was sweet and had a taste that I can’t describe, I’d say a little bit more herbish, but it was also milky. I liked it. After that we passed some more time walking around and got smoothies from another shop. Mine was papaya. One thing that’s really nice here is that there are a ton of these types of smoothie shops around where the smoothies are all made with fruit that you see the workers take out of the fridge. My favorite smoothie that I’ve had is actually avocado flavored, strangely enough. With honey it has an almost vanilla-like taste. We got back at 11:30 and I pretty much immediately went to sleep because I needed to wake up at 6:30 this morning!